Nagle Dam was originally built as one of the main sources of water for the city of Durban. Today, it is set like a jewel amid the surrounding mountains. So whatever you choose from our range of accommodation in varying situations around its banks, you can be sure of a different view of the waters of this wonderful focal point . . .
Island Safari-style Tented Accommodation: Enjoy the African experience of sundowners and braais under the stars together with the comfort of our six modern safari-style tents. Each offers ensuite accommodation for two people in furnished comfort. Not available for bookings ! 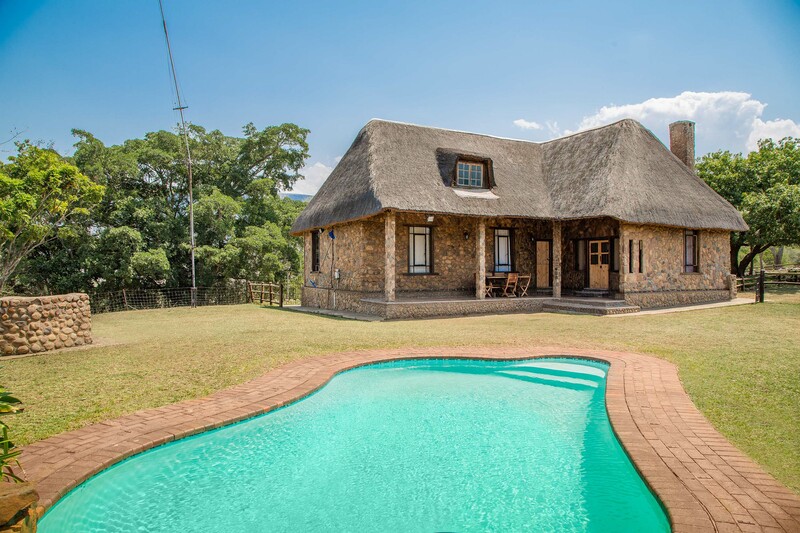 Nagle Lodge: This six-bedroom former farmhouse with views across the dam and valley easily sleeps 12 and includes five bathrooms, of which three are ensuite. The lodge is perfect for a family reunion, friends’ get-together, birthday celebration, bridal shower or stokvel outing. The stoep trimmed with broekie-lace is a special spot for morning coffee or sundowners – or excellent birding. Relax in the lodge’s comfortable furnished lounge and 12-seater dining area, which also includes a television for your use. The kitchen is equipped for self-catering. Msinsi Lodge: For an exclusive getaway, choose this gracious thatched sandstone lodge for six, known to insiders as “Msinsi’s gem”. It’s set on a 40ha peninsula and you can relax in your private garden or beside your private pool, feasting on views of the dam and surrounding mountains. When you can tear yourself away from the sunset or the canopy of stars, DStv is also available here for your use. While this lodge has a well-equipped kitchen for self-catering, you can also book a fully catered option for your stay. Camping/caravanning: Nagle can even hire you a tent complete with bed and linen to enjoy one of our 40 sites. Washing facilities with hot-water showers are well maintained and all sites are without electricity. The camping area is secured with fencing and a gate. Food and entertainment: All accommodation has braai facilities and is self-catering. Or, for a reasonable additional charge, at Msinsi Lodge you can opt for a fully catered option when you make your booking. Our onsite kiosk sells drinks, ice, chips and wood. Extra beds: Whatever accommodation you’re staying in at Nagle, from our lodges to our campsite, we can provide extra beds for you if necessary – just let us know. At Nagle Dam and Game Reserve, there’s a glacial rock pavement dating back to 300 million years to when Africa was part of the supercontinent of Gondwana. Beyond our swimming pool framed by sausage trees and near the fenced game reserve, you’ll find Notuli Hutted Camp with its choice of charming thatched accommodation to suit any visitor. Or choose to dream by the dam in your caravan or campsite. . .
Chalets: There’s ample room for a family or group of up to six in our spacious chalets. 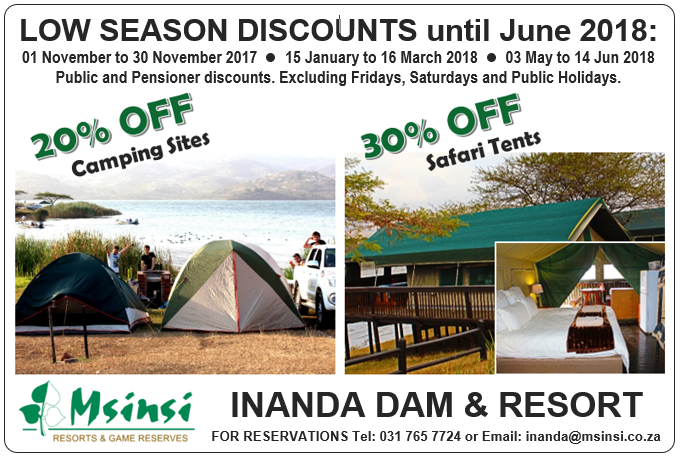 You’ll find they’re all fully and comfortably furnished and equipped for you all to relax after a great day exploring the reserve or having fun at the dam. Notuli Rondavels: Our rondavels sleep two and have now been cleverly redesigned to include an ensuite bathroom and kitchenette, offering you a cosy and well-planned option. Notuli Cottage: Wake up to spectacular views of the dam and panoramas of the many shades of the Karkloof Mountains when you’ve chosen our exclusive six-bed Notuli Cottage. Television is also available here for your use. Camping/caravanning: Albert Falls has 110 sites a 60 at Notuli, overlooking the game reserve; and 50 at Pelican Bay overlooking the dam. Well-maintained washing facilities with hot and cold water showers help ensure that during your holiday with us, you concentrate more on relaxing than logistics. Food and entertainment: All accommodation is self-catering. The Albert Falls shop provides some basics and local takeaway services can deliver.